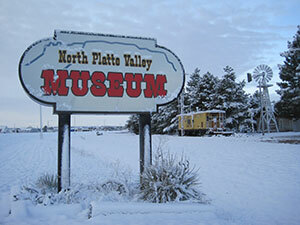 Legacy of the Plains Museum was created in 2013 through the merger of two well-established institutions: the North Platte Valley Museum and the Farm And Ranch Museum. FARM was established in 1988 as the Western Nebraska Society for the Preservation of Antique Farm Equipment. Its mission was to collect and preserve the history and artifacts of agriculture and its cultural impact in the Nebraska Panhandle and to increase awareness of agricultural history and establish a museum at which historical agricultural techniques could be demonstrated. The organization changed its name to Farm And Ranch Museum in 1997 and bought 100 acres of land which now serve as the Legacy of the Plains campus. FARM established fields for demonstration crops, pasture(s) for a herd of longhorn cattle, storage/display for the organization’s extensive collection of antique farm and ranch equipment, a 1930s farmstead (the Wiedeman House), a demonstration blacksmith shop and a maintenance shop. A 12,000-square-foot exhibit building and 7,000-square-foot visitor center were built in the first decade of the new millennium. The North Platte Valley Historical Society was founded in 1961 and formally incorporated as a nonprofit organization in 1969. Its mission was to collect and preserve the history and artifacts of the North Platte Valley—particularly that of Indians, emigrant trails, early settlement, and the cattle industry—and to establish a museum and promote history to the public. NPVM operated in a rented building in downtown Gering until 1974, when the collection moved to a campus at 900 Overland Trails Road. The campus featured a log cabin, sod house, windmill and caboose, plus about 12,000 square feet of interior space for exhibits, archives and storage.